Product prices and availability are accurate as of 2019-04-20 03:45:51 UTC and are subject to change. Any price and availability information displayed on http://www.amazon.com/ at the time of purchase will apply to the purchase of this product. Miller Industrial MIG 4/0 Kit is designed for use with AlumaFeed synergic aluminum welding system. 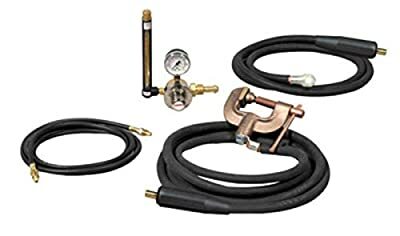 It contains Smith flowmeter/regulator with 10' gas hose, 10' 4/0 feeder weld cable with dinse connector on one end and a lug on the other, 15' work cable with Dinse connector on one end and 600 A C-clamp on the other.